An agreement entered into by a range of international organisations and others and announced this week is expected to lower the price of early infant HIV diagnostic technologies by 35 percent, according to the parties. The 90-90-90 target provides that by 2020, 90 percent of all people living with HIV will know their HIV status; 90 percent of all people with an HIV diagnosis will receive sustained antiretroviral therapy; and 90 percent of all people receiving antiretroviral therapy will achieve viral suppression, the press release said. The agreement was not made available as of press time. Global partners in the Diagnostics Access Initiative, which was launched in July 2014, were part of the negotiations. These included UNAIDS, the Clinton Health Access Initiative Inc., the United States President’s Emergency Plan for AIDS Relief, UNITAID, and the Global Fund to Fight AIDS, Tuberculosis and Malaria. Following the agreement, the new access price will be USD 9.40 per test for diagnosing HIV in early infants. Despite the World Health Organization’s recommendation that all children exposed to HIV receive early infant diagnostic screening within the first two months of life, in part due to high cost, only around half of the children actually receive the diagnostic screening. This is the second major price reduction agreement that the Diagnostics Access Initiative has entered into with Roche Diagnostics, first one being in 2014. The announcement comes as the IAS annual conference is taking place in Vancouver. 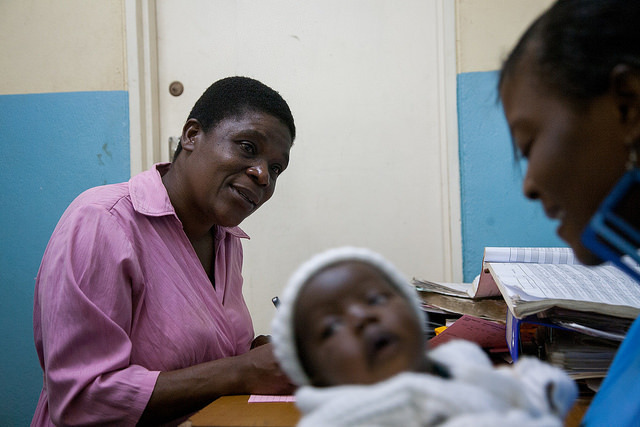 "Aid Agencies Hail Agreement On Access To Early Infant HIV Diagnostic Technologies" by Intellectual Property Watch is licensed under a Creative Commons Attribution-NonCommercial-ShareAlike 4.0 International License.